The French mathematician and philosopher Descartes is sometimes called the father of modern philosophy and one of the first proponents of the scientific method. He is considered the cofounder of analytical geometry, along with Fermat, thus preparing the way for the invention of the calculus; one of the appendices of his book Discourse de la méthode is entitled La géométrie and contains his contribution to the subject. In the appendix he showed how to use algebra to solve problems in geometry and how to use algebra and geometry together working in partnership. Ironically, he did not introduce Cartesian coordinates; this was done by Fermat. Notationally he introduced the use of exponents and the terms `real' and `imaginary'. 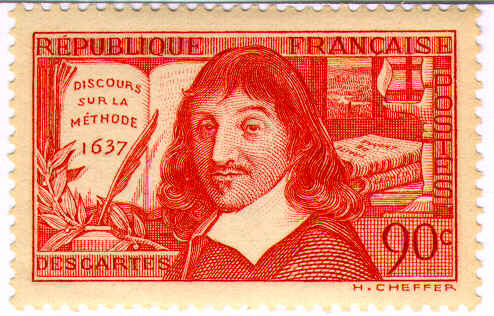 When it was dicovered that the stamp honoring Descartes (No. 330) had the wrong title for his book, the French government quickly printed numerous copies of a corrected stamp (No. 331).